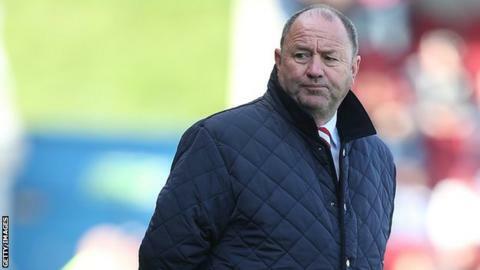 Cheltenham Town manager Gary Johnson has warned his players they will face their very own ice-bucket challenge, if they continue to start games slowly. Johnson described their start against Chester on Tuesday as "slovenly". And he says he may well re-introduce a tactic first used in his days at Cambridge United with boss John Beck. "All these people saying the ice bucket challenge is new, I was doing it with John Beck at Cambridge 15 years ago," Johnson told BBC Gloucestershire. "We've spoken about something we did in my Cambridge days when we used to throw cold buckets of water over players before a game after a long journey. "The players won't like me mentioning it, but we may start doing that if we start slothenly again. We did it so well at Cambridge that we did it at home games too, so there was no respite from it." Cheltenham are unbeaten in the National League with three draws and one victory, but Johnson wants a more assertive start against Barrow on Saturday. "You've got to keep the players on their toes to keep their minds active and keep them guessing," he added. Defender Daniel Parslow said the possibility of being soaked in cold water was something the squad are keen to avoid. "He told us this story prior to the game," Parslow told BBC Gloucestershire. "It worked back then and after our poor start on Tuesday the threat might be very real. "It's something we need to look at because we can't afford to start games like Tuesday."